Applications: For use on 115 and 125mm angle grinders & metal finishing machines. These ceramic flap discs are suitable for all the applications zirconium flap discs are used for, but will give much longer (typically 3 times) the life and grind faster, both on mild and stainless steel. They will remove millscale. We stock these in the coarser 40 and 60 grades, which make great alternatives to bonded stainless steel grade grinding discs and are safer due to low risk of fragmentation. Product Notes: The flaps are made wth polyester backed ceramic abrasive cloth, ideal for heavy grinding duty. Slightly conical profile for ease of surface contact. Compliant with EN14713. 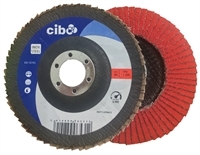 Made in Belgium by Cibo Abrasives, specialist in abrasive products for stainless steel finishing. Also Available: For gentler action, or to remove millscale without excessive marking, you may prefer grade 80, which is available in the X-Tend flexi-edge range.